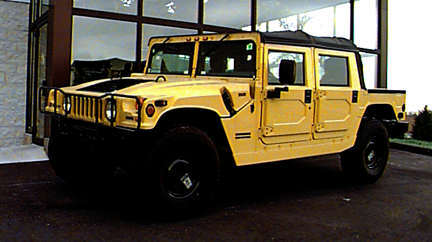 Hummer '99 Open Top @ Lynch Hummer. '99 Open Top Turbo Diesel engine, Deluxe interior, CD Changer, Central tire inflation, Cruise, A/C, Driveline protection, Brushguard, Trailer towing package, Heavy duty wheel w/beadlock, Power mirrors, Power windows, keyless entry, Rocker panel protection, Deluxe rear view mirror, Heavy duty rear bumper, Runflat tire system, Heated windshield, Highway touring tires. Yellow.